SWIMMING POOLS GO OFFSHORE | "Global Possibilities"
Before the industrial boom that transformed waterfront cities into dirty manufacturing hubs in the 19th and 20th centuries, urbanites would take a dip in the rivers, harbors, lakes, and oceans that are a part of many cities to cool off in hotter months, enjoying a break from the steamy weather. But as these water bodies that served as conduits for cities became increasingly polluted, only the bravest or perhaps poorest swimmers would dare go in. 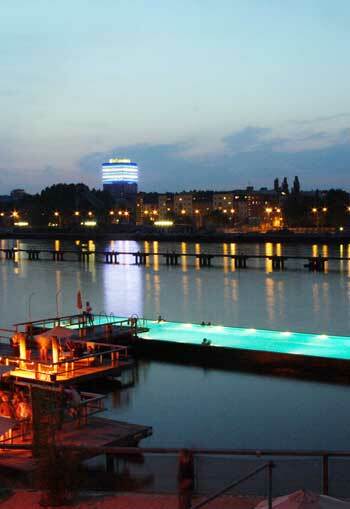 Today, as smart cities reclaim their riverfronts as places for recreation and invest heavily in improving water quality, they are getting closer to turning their aquatic resources back into the natural swimming pools they once were. Some cities still aren’t there with water quality, so they use floating pools in barges, which keep the river and pool water separate. 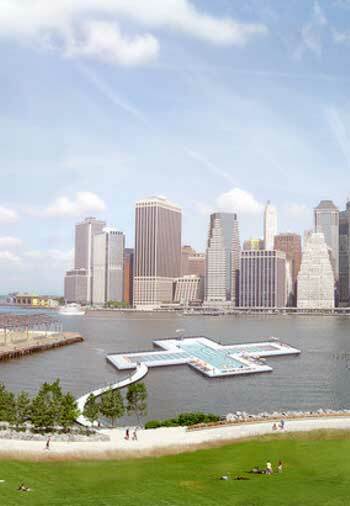 In South Bronx, New York City, Baretto Point Park, which was transformed from a toxic brownfield into a park, became home to the Floating Pool Lady, a floating barge-pool in the East River, in 2008. And in Berlin, a wooden footbridge filled with hammocks leads swimmers out to the 30-meter-long barge-pool Arena Badeschiff. There is a small cafe and bar where Berliners can hang out after playing volleyball. A more ambitious new wave of offshore pools aims to use river water for these offshore pools, but filtering out pollutants first. 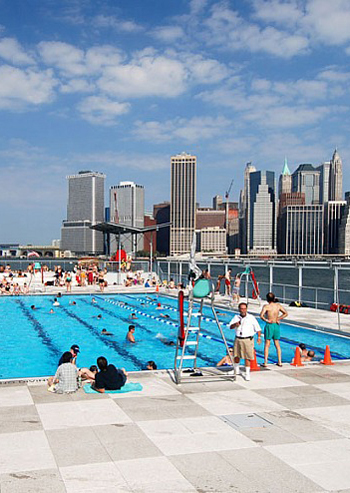 In NYC, + Pool seeks to create a 200-feet wide by 200-feet long pool in a plus-sign shape; its walls will filter out pollutants using a system of membranes set right into the East River. The plus-sign shape will enable greater flexibility: the pool can be separated into four different segments for separate audiences, combined into an Olympic-length swimming pool, or opened up into a big free-for-all space. Earlier last year, they began testing a pilot membrane in the river to evaluate its performance against different conditions over 6 months. Both + Pool and Studio Octopi are relying on grants and kickstarter campaigns to make their filtration-enabled pools, which will be managed by non-profit organizations, possible. + Pool has raised more than $250,000 but needs about $15 million. 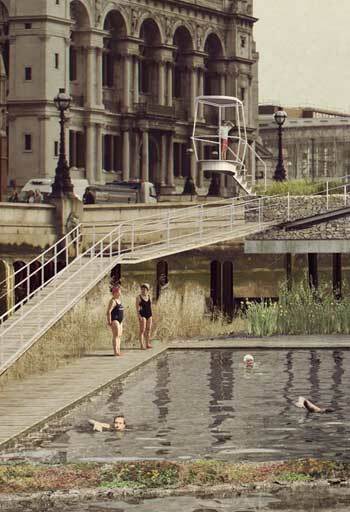 While these floating pools are certainly great amenities, the most sustainable long-term solution will be to simply clean up these polluted bodies of water so urbanites can safely swim in them once again. This is what Copenhagen achieved in 2008. 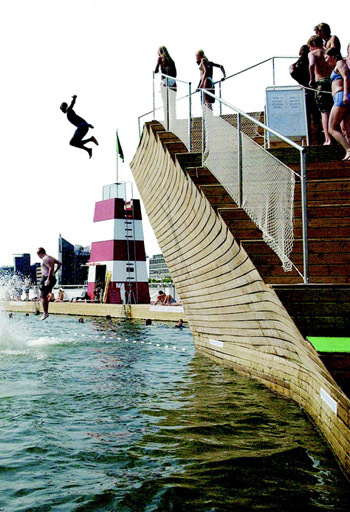 The city then took advantage of its newly-cleaned-up harbor with Harbor Baths, a set of designed pools that make their waterfront even more accessible. Locals get to it via pedestrian and bicycle paths that wind along the waterfront. And there’s even a heated bath in the complex for winter bathing. 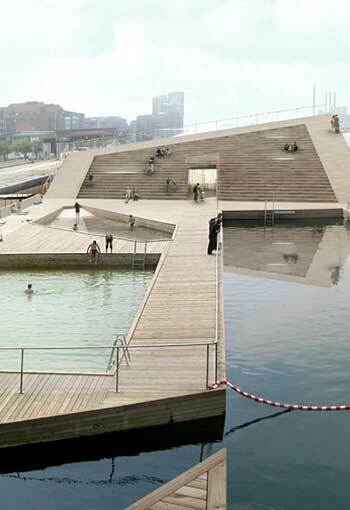 A floating wooden deck created by Danish architecture firm BIG and JDS features a fantastic diving board, so locals can jump right into the safe harbor sea water. 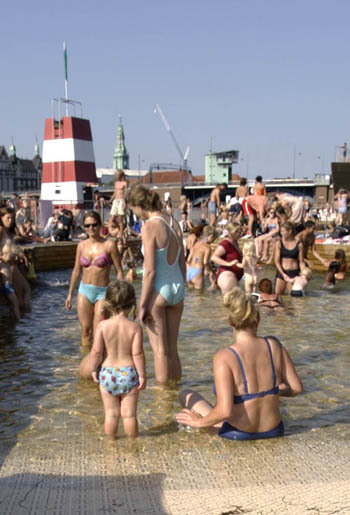 The pool is also free of charge to all Copenhageners. Now, this is the idea.